In this election season, it is important to be reminded once again how out of context many Christians interpret Jesus' "render unto Caesar" statement. Some Pharisees come to Jesus in order "to trap him." They begin with empty flattery: "Teacher, we know that you are sincere, and show deference to no one; for you do not regard people with partiality." Jesus, of course, is not taken in by their empty words. But, nevertheless, the question they ask Jesus is politically charged. "Is it lawful to pay taxes to the emperor or not?" They appear to have Jesus in a no-win situation. If he tells them to pay the tax, then he risks losing his following among his fellow Jews, who despise the tax and see it as a compromise with paganism. If Jesus recommends withholding the tax, then they have something to charge him with before Pilate. Previous messianic movements started as a tax revolt. The Romans squashed both of them executing the messianic pretenders. It is interesting to note that Jesus does not have the coin in question, but those who ask the question do, revealing their own hypocrisy. 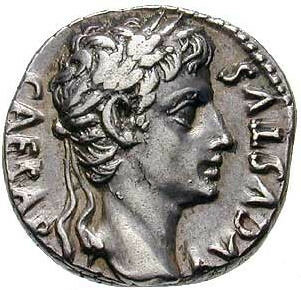 As the image of Caesar is on the coin, says Jesus, give it to Caesar; but you give yourself, he continues, to God. Jesus is not saying that he likes the tax, but neither is he suggesting that the Jews start a tax revolt, which would bring the wrath of Rome down upon him. The "image" imagery is clear. The coin that is in Caesar's image should be given to Caesar; but God's people, who are in the image of God, which is being renewed, need to give themselves completely to God. Faithfulness to God, reflecting God's image in the world and to those around, even in undesirable circumstances, is what God requires. Jesus' question, "Whose image is this, and whose title?" echoes Genesis 1:27. The coin bears the image and title Tiberius Caesar, son of the Divine Augustus-- idolatrous words and a painful reminder of oppression to a conquered people. Yet these are a people who know that they were created in the image of God, and though they live under subjugation, they continue to bear the image of God. The coin is a temporal thing that is given to Caesar in exchange for particular "blessings," but the true blessing of life, of breath, of body, of soul, mind and spirit are from God and should be offered back to God. You, who bear the image of God, belong first and foremost to God. Allegiance to God and to Caesar do not occupy two separate realms; Caesar's realm is a limited one within the all-encompassing reign of God. Yet Caesar is rarely content with limits. Jesus' claim carries a price. Within days of this exchange one of the charges brought against Jesus as he stands before Pilate is "forbidding us to pay taxes to the emperor" (Luke 23:2). Faithful service to God is always costly. Blessing and sacrifice are closely linked in Christian living..."
This text is not about paying taxes; it's about being God's people in God's world. "The earth is the Lord's and everything in it," says the psalmist (Psalm 24:1). The empire may claim to own everything; but only God truly does. And one day, in God's own good time, the empires of the world will come to know the truth. As Ben Witherington rightly states, "Since Jesus is Lord of all, Caesar is simply a temporary, subordinate human ruler. It is not a rivalry or contest then or now, and one day the real Lord will be the judge of all." If Caesar wants his pittance, God's people will give it to him. But only Christ and his kingdom can rightfully claim their total allegiance.